BUICK 1930-1940 - $10.00 : Bob Hoyts Classic Inspection Stickers, Add a Final Touch to your Restoration! 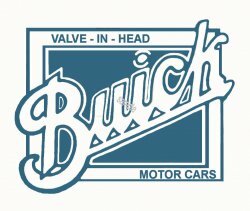 This Buick Logo from the 1930s and 40s originally went on the engine block but we have carefully restored and reproduced it with our patented "Peel and Stick" format that allows buyer to place it inside your classsic car window. For an additional $5.00 this sticker can be ordered in reverse with adhesive on back to stick it on the engine. It is appoximately 3 inches long by 2" wide.